Choosing a career when you are younger can be very difficult, especially if you are interested in a number of different disciplines. If you are interested in biology but you want a varied career, why not consider becoming a marine biologist? Here is some information about how you can become a marine biologist. To become a marine biologist you will need to have good qualifications starting from GCSE level. It is particularly important to excel in chemistry and biology. At A-level, you should go on to study biology and chemistry if you want to get a place at one of the leading universities for the subject. Those who do not have these qualifications may still be able to study marine biology if they have existing experience in a similar field. Some technician posts in the field of marine biology only require strong GCSE or A-Level results. These posts can be good beginner posts for those who want to take a vocational route rather than an academic one. Before you commit to a lifetime as a marine biologist, you should make sure that you understand what marine biologists do as part of their job. 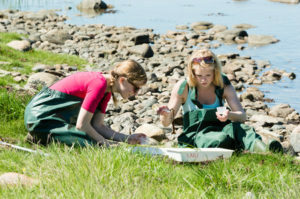 To gain an insight into the career, you should consider joining the Young Marine Biologist club. This club runs work experience weeks, training and special educational events to help younger people to understand what it is like to work as a marine biologist. Young candidates will be able to ask questions and find out more about marine biology at these events. Undergraduate degrees in marine biology are offered at a handful of universities. Most of the universities that offer marine biology are based along the coast. Leading universities in the field include; Portsmouth, Liverpool, Bangor and Plymouth. Do not worry if you only develop an interest in marine biology after you have taken your undergraduate degree, because it is possible to start studying marine biology at a post-graduate level. Although you are more likely to be accepted onto a post-graduate course if you have an undergraduate degree in biology, it is also possible to get onto one of these post-graduate degrees with most other natural sciences or related subject areas. Even if you already have an undergraduate degree in marine biology, a postgraduate degree may also be required to work in some higher skilled research positions. It is very difficult to summarise the main skill sets required by marine biologists, because each role is different. Whilst some marine biologists will spend most of their time in the laboratory, others will spend longer periods of time out in the field. Most marine biologists will do a mixture of the two roles over the course of their career. Whether you work in the field or the laboratory, it is important that you have strong powers of observation. Fine and accurate observational skills are essential for measuring and understanding the unique changes in marine biology. Precision and care are needed when collecting and analysing delicate samples. Particular skill is needed if you are required to collect samples in physically demanding conditions. Once you are qualified, there are plenty of prospects in marine biology. There are marine biologist roles in the public and private sector. Public sector roles include jobs at the Waterways Board, the Environment Agency and with the Fisheries Committee. Private sector roles include; jobs in the oil industry, the mining industry and work doing environmental impact assessments. There are also a variety of funded research places within universities for people who want a career in post-doctoral research.